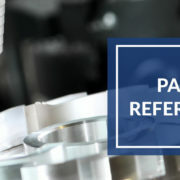 A material is classified as a composite if it is made up of at least two unique constituents that when combined yield beneficial physical and mechanical properties for a number of different applications. A binding agent that is the matrix material is filled with either particles or fibers of a second material that act as reinforcements. The combination of strength, weight, and rigidity make composites extremely useful for the automotive, aerospace, and power generation industry. Often the matrix material of particulate-reinforced composites is some form of plastic, and the reinforcement material is either glass or carbon particles. These are sometimes called “filled plastics,” and are typically very abrasive materials. Many composites are layered with varying fiber orientations, which increase the strength of the material and are called fiber-reinforced composites. These problems are all caused by unique conditions created by composite materials, and can be very tricky to correct. 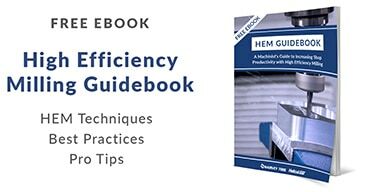 The simple fact of cutting a combination of multiple materials at the same time introduces many factors that make it difficult to strike the right balance of the proper tool for the job and appropriate running parameters. The following tool styles provide solutions for a wide array of composite concerns. Composite Drilling Applications can face the same issues, and proper drill choice can help as well. Straight Flute Composite Cutters are designed to prevent delamination of layered materials by applying all cutting forces radially, eliminating axial forces from a typical helical cutting edge. Cutting action is improved with a high positive rake angle for shearing fibers and eccentric relief for improved edge life. Shallow ramping operations can be performed with this tool, but the largest benefits are seen in peripheral milling applications. The Compression Cutter consists of an up cut and down cut helix. The top portion of the length of cut has right-hand cutting teeth with a left-hand spiral. The lower portion of the length of cut has right-hand cutting teeth with a right-hand spiral. This creates opposing cutting forces to stabilize the material removal process when cutting layered composites to prevent delamination, fiber pullout, and burs along the surface. Compression of the top and bottom of the workpiece keeps the layered bonded together. The Chipbreaker Cutter is ideally suited for roughing and profiling composites with a high percentage of fiber fill. The notch-like chipbreakers shear fibers and shorten chips for improved material evacuation. This specialized geometry is great for keeping chips small and avoiding “nesting” of stringy fibrous chips around the cutter. 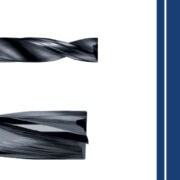 Diamond Cut Composite Cutters come in two different geometries: End Mill Style and Drill Mill Style. Although the end mill style tool is center cutting, the drill mill style has a 140° point angle, making it more suitable for plunge cutting. This is great for clearing out pockets in the middle of composite sheets. 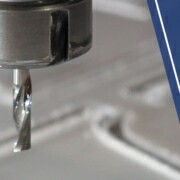 Both the end mill and drill mill style share the same downcut geometry on the outside diameter. This diamond cut tool receives its name from the combination of left-hand and right-hand teeth. The tool is predominantly a downcut style – a geometry that allows for these tools to effectively rough and profile high fiber reinforced or filled composites, breaking up chips and shearing through fibers. The diamond cut tools have a higher flute count, which some may intuitively think would lead to a better finish, but this is not the case as this line of tools contains right-hand and left-hand teeth. There is a trade-off between an increased ability to shear fibers and leaving a poorer finish. The chipbreaker style tool, although not as effective as shearing fibers, is ultimately designed for the same purpose but leaves a better finish as all of the flutes are facing the same direction. The Composite Finisher has optimized geometry for finishing in composite. 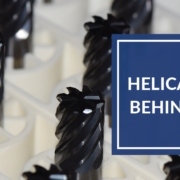 A slow helix and high flute count for more contact points ultimately renders a smooth finish by minimizing fraying of fiber-reinforced and layered materials. Composite materials, especially those with glass or carbon fiber, can be particularly abrasive and have a tendency to wear down the cutting edge of carbide tools. If one is looking to achieve the best tool life and maintain a sharp cutting edge, then choosing an Amorphous Diamond coated tool is the best option. This thin coating improves lubricity and wear resistance over its uncoated counterpart. Using a tool with CVD diamond coating can be very beneficial in extreme cases, when fiber fill percentage is very large. This is a true diamond coating, and offers the best abrasion resistance, but a slightly less sharp cutting edge as it is a thicker coating. 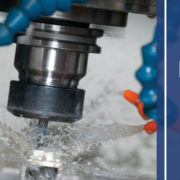 PCD diamond tooling offers the best tool life. If it a solid diamond wafer brazed to a carbide shank, and can maintain the sharpest edge of any diamond tooling. However, PCD is limited to straight flutes, and can come at a higher price. Composite materials are being increasingly utilized in today’s manufacturing world for their impressive strength to weight ratio. This growth has stimulated innovative techniques of cutting composites seen in the tool choices above. 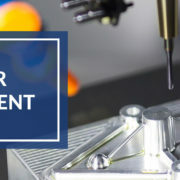 Harvey Tool’s variety of geometries helps any machine shop tackle composite cutting applications and will continue to offer groundbreaking solutions to these types of manufacturing problems.